ANN ARBOR, Mich. — The search for the best preschool or childcare option is often a challenging experience – and many parents aren't sure if the one they pick is safe and healthy for their child, according to a new national poll. About 62 percent of parents say it's difficult to find childcare options that meet all of their standards, and only about half were very confident that they could tell if a childcare option was safe and healthy, according to the C.S. Mott Children's Hospital National Poll on Children's Health at the University of Michigan. The most important factors on parents' checklists depended on the childcare setting. Parents of children attending childcare centers prioritized safety (background checks for staff, locked doors) and practical considerations (cost and location). Parents of preschoolers named similar safety factors as the most important factors they consider when choosing care, as well as those related to play (active play every day in a safe outdoor play area). In contrast, the most important factors among parents whose children attend an in-home childcare ranged from healthy food and clean kitchens, to availability of books and educational toys. Still, 9 in 10 parents felt that childcare centers and in-home childcare providers should have the same health and safety standards. "Parents want to feel confident that all childcare and preschool options meet certain standards," says poll co-director Sarah Clark. "Parents could then choose their preferred childcare option without compromising their child's health and safety." The biggest deal breakers when looking for childcare reflected parents' overall focus on safety. Roughly 70 percent of parents said they would not leave their child in a school or center located in a "sketchy" area while 56 percent said they would not consider a place with guns on the premises. Additionally, 48 percent of parents said the presence of other adults (not including staff) was unacceptable in a childcare setting. "Parents were clear that certain characteristics would automatically remove a childcare or preschool option from their list," says Clark. "First and foremost is safety." Other deal breakers included health-related considerations. 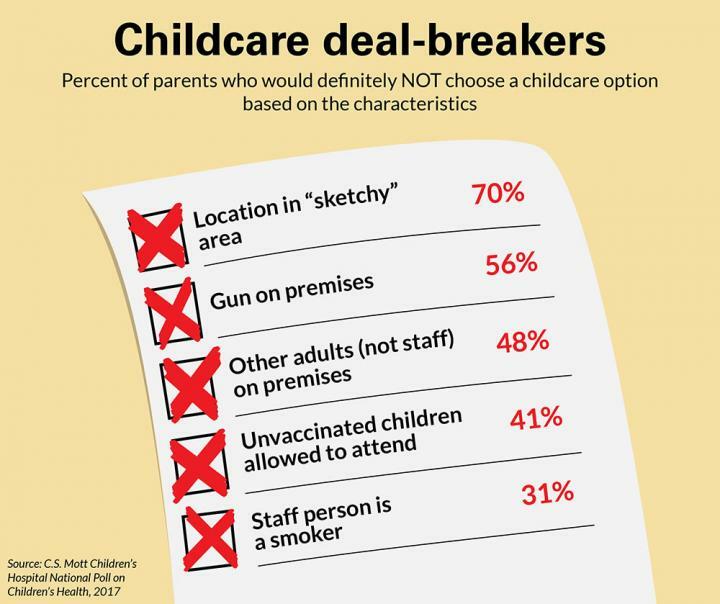 About 4 in 10 parents said allowing unvaccinated children to attend childcare was a deal breaker and about 3 in 10 would not allow their children in a home or facility where the staff person was a smoker. "Health-related considerations are important for all children," Clark says. "But they also carry an increased risk for children who have special health needs such as asthma." The report includes responses from a nationally representative sample of 307 parents who had at least one child ages 1-5. "Parents want to be confident they are making the right choice when it comes to leaving their children in someone else's care," says Clark. "Our poll demonstrates the challenge of choosing a preschool or childcare setting that meets all of a parent's criteria. Safety and health factors are important to parents, but too often, parents aren't sure how to determine if a childcare option is safe and healthy." Clark says parents should take extra steps to evaluate potential childcare or preschool facilities in several different ways. This may include drop-in visits to observe safety features, such as the location of a playground relative to traffic or the security of an entrance. In reviewing the website for cost and hours of operation, parents should also look for health-related policies like vaccination requirements for children and staff, background checks, and security policies. Parents should also inquire about other aspects of child safety they may feel are important, such as whether a gun is stored in the facility or whether other adults will be onsite while children are there. "Some health-related characteristics are observable while others, such as how often toys are cleaned, are not as obvious," Clark says. "The more research parents do ahead of time, the more confident they will feel that their children are in a safe and healthy environment."